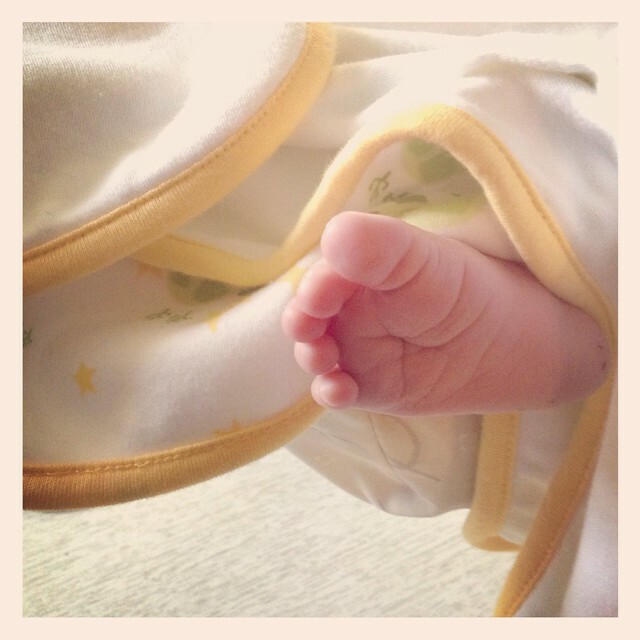 More than two weeks have floated by, after the birth of my second son. He was born swiftly and smoothly on a beautiful Summer evening, 7 years to the day after his older brother. To say that you can fall head over heels in love with another human being so quickly is an understatement of epic proportion. He fits into our family in a way I couldn't have anticipated, and the darling boy even let me bake bread the day after I arrived home. Physically, I feel like I can do anything. Recovery time has also been fast, much faster than with my first son - and I feel like I have all of the energy I need to make up for lost time in the kitchen. Grains have been sprouted, ferments set to bubbling, farmer's markets attended, and the only area I feel lacking in is actual meal planning. Sporadic baby interruptions just before the dinner hour have slowed me up a little, and "piece catch" meals hit the table in great thanks to my freezer, garden basil, and last minute imagination. When I was first married and working full time, I recall I used to actually plan meals in a little notebook... and I'm thinking it might not be a bad idea to bring that method back. But meanwhile, things are good in my world. Babies have a way of making everything feel fresh and amazing. Kind of like a fresh bottle of brandy. Before the comments of nursing mothers and alcohol come flooding in, I'm not actually drinking the brandy - and to be honest, despite brandy being the most often purchased liquor in my state, it's really not even my favorite. But used to cook with or inoculate fruits? It might just be my favorite thing ever. click the photo for the recipe. Alcohol in general is still not on my grocery list. On the continuing path to our household economic recovery, (and fresh off the path of 9 months of abstinence anyway...) I can't see spending a red cent on something as trivial as alcohol - especially since it isn't really a necessity. 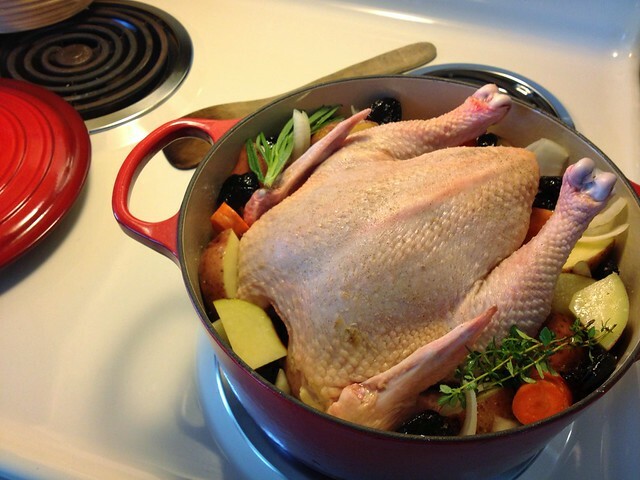 But my parents were here for a Sunday dinner when my newest babe was just 5 days old, I knew I had to have them try one of my favorite chicken-in-a-pot recipes from Dorie Greenspan's Around my French Table. It's a recipe that calls for Armagnac, which is a spirit that I find completely wonderful, though prohibitively expensive to me. Fortunately, if you enrich the much cheaper brandy with dried prunes and cook it with chicken, the flavor is stellar nonetheless. My Mom and Dad visited the first liquor store they have probably been in since before I was born to get me a bottle of brandy for the dish, and I've been making good use of the rest of the bottle in the days since that chicken was earnestly devoured. My neighbor has a tart cherry tree in her back yard. She generously offered them free for the picking, and another neighbor graciously offered to pick some for me, since we were in the midst of a heatwave. The cherries were deliciously deep red, tart, and perfect, and I instantly knew I had to make brandied cherries. The last time I made them was maybe 3 years ago, and I still have a handful of faded cherries submerged in liquor stashed in the back of my fridge. I couldn't remember what ratio or recipe I used, so I went with one I found on Serious Eats. The general ratio for that recipe was one part sugar (I used raw sugar), one part water (or cherry juice) to two parts brandy. 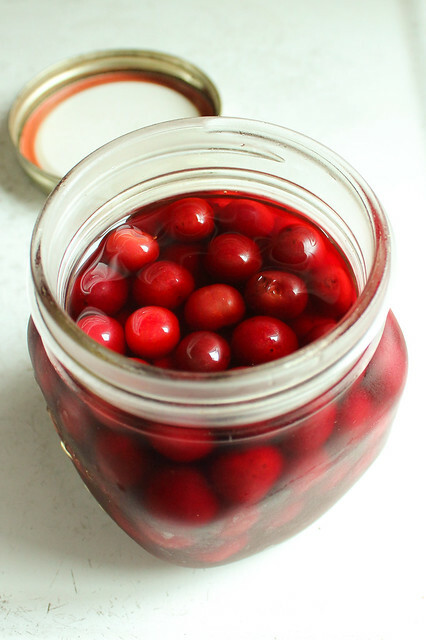 I didn't pit the cherries, and didn't bother to poke a needle through each one either: I figured a bit of time on the counter and more time in the refrigerator would take care of any of that extra work for me - and I was right. I let them sit out on the counter for a few days before transferring, and already the brandy was dark red and the cherries nicely spiked with flavor. Some new friends recently transplanted back to the Midwest from Oregon stopped by yesterday to visit and thoughtfully brought me perfectly ripe raspberries. 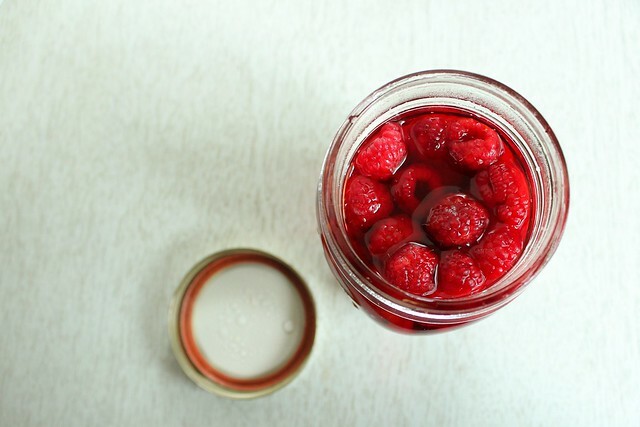 I decided to try brandying the raspberries using mostly the same method, but using the ratio of 1 part each sugar (white granulated sugar in this case to preserve the true flavor of the raspberry), water, and brandy. 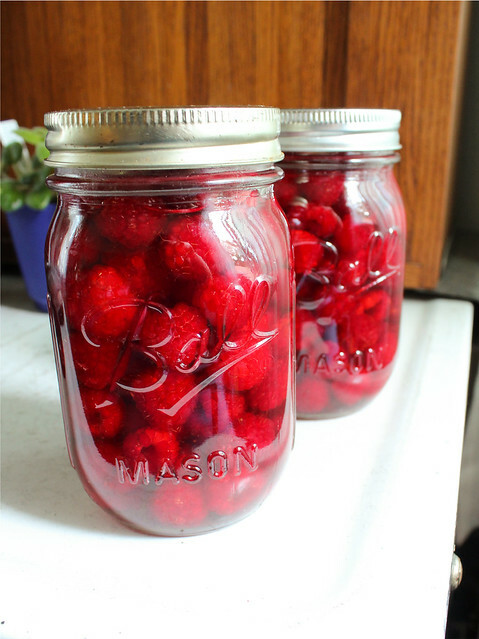 I packed the raspberries into clean pint jars, heated the sugar and water over medium heat until the sugar just dissolved, and then added the brandy off the heat. Just standing overnight led to color saturated liquid that is less potent than the tart cherries, but so excellent tasting I can hardly wait to have an excuse to make a pound cake or some shortcakes, maybe even a "poke" type cake that can make use of the bright, spiked raspberry juice. There are some words I hate using to describe food, and luscious is one of them... but these berries truly are luscious. I might be silly to compare my new babe to a bottle of brandy. But in a way, it fits. When you don't have something for a long time, you can really appreciate it all the more, and that is how a second baby is for me. I am reminded of how wonderful every new moment was with my first little son, and just what is is store for me with my second. I marvel over impossible long eyelashes and tiny fingernails, I get to know all the expressions and nuances of a brand new personality, and savor each one for the fleeting moment in time I now know it is. Like the bottle that empties too quickly, but lives on in what it has preserved, I document in both mental and physical photographs the new life I've been blessed with. I will most happily decant both in the future and be able to feel as full of emotion as I am right now.